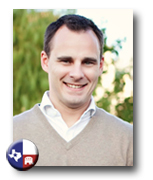 Kyle Scott, PhD, teaches American politics and constitutional law at the University of Houston and is a candidate for the Lone Star College Board of Trustees, Position #2. He has decided that in addition to writing about politics he should join in on the policymaking. In running for the LSCS Board of Trustees he hopes to restore fiscal sanity by opposing the addition of more debt and by keeping taxes and student fees down. His first and last obligation is to the taxpayers and the students. In addition to his four books and dozens of academic articles, Kyle provides commentary on current events for Liberty, Forbes, Reuters, Christian Science Monitor, Foxnews.com, Washington Times, and dozens of local outlets including the Orlando Sentinel, Charlotte Observer, Philadelphia Inquirer, Houston Chronicle and Baltimore Sun. He is eager to write for TexasGOPVote.com and humbled by the opportunity to speak directly to Texas Conservatives. "The conservative message is not easy to accept or digest because it forces the individual to take personal responsibility for his or her successes and failures, to not turn outward for assistance, but to turn inward for answers. It is much easier to point at someone else and say it's their fault; it is much more difficult to look in the mirror and take responsibility."